The GREEN-CORE mattress is constructed specifically of 100% new high-density polyester fibers. The polyester fibers are vacuum bonded for stability and support. 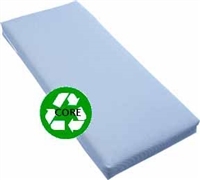 With a core weight of 16 ounces per square foot this densified polyester fiber core is designed to be used as a mattress core in an institutional setting. The core is encased with Mono Loft Pyro-Shield which provides the fire barrier that is so critical in a commercial setting. A variety of safe, durable, quality tickings that Bourdon's is known for finishes the GREEN-CORE mattress. The core is encased with Mono Loft Pyro-Shield which provides the fire barrier that is so critical in a commercial setting. A variety of safe, durable, quality tickings that Bourdons is known for, finishes the GREEN-CORE mattress.